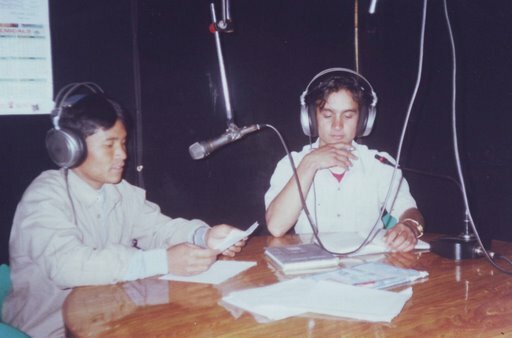 It was mid-February 2005 when we shifted to Rukum district the FM station of Radio Janaganatantra (People's Republic), which had been established in Rolpa and banned by the government of Nepal. As Rolpa and Rukum belonged to the mountainous region of Nepal, the hill where the radio station was conducted was still covered with the snow. We had to struggle hard to transport the radio instruments without leaking any information to others, especially, to the government agencies, as our activities had been declared illegal. However, rumors had been spreading that the radio station was going to be brought to Rukum district. There was a Jehari Pasal (a sweets house) in Thawang of Rolpa where we had been conducting the FM station. We called it commune's Jehari Pasal. When we were ready to leave Thawang of Rolpa for Rukum the girl at the sweet house said, "Please do not forget us. Keep on coming." I had had an old and deep affection with that Jehari Pasal. I had gotten a chance to take the taste of the Jeheri (sweets) of this shop in my first visit to Rolpa. After that, when I went to my home district, we had appreciated a lot about the Jehari of Rolpa. "How is Rolpa? How is Thawang?" every friend of mine would ask me with excitement, because it was a remote and inaccessible mountainous area. But as I had already been there, I used to tell them proudly that it was the place of the red people (revolutionaries). I told them that it was not easy to understand Rolpa and its people just viewing it from outside. I said nothing is found by just viewing it from outside, but if observed deeply it smells of revolution and sacrifice. Yes, it is true that it is very difficult to understand Rolpa. It is difficult to understand Thawang, which has been situated in the lap of Jaljala, a mountain. One needs to play and one needs to smile with it to understand it truly. Could I understand it in my very first visit itself?" No, I could not feel it wholly even in my second visit. However, I said to my friends, "Please have a taste of the commune's Jehari at least once if you ever get a chance to go to Thawang." Really, the commune's Jehari is very popular. Everyone lucky enough to visit Thawang should take a taste of the commune's Jehari; otherwise, their journey is incomplete. "What special thing did you do in Thawang?" I asked Ujir Magar, a journalist of the Kantipur, the national daily, through our intercom set of Radio Janaganatantra. He was quite excited; "First of all I ate the commune's Jehari, Mr. Kishor." Ujir's reply reminded me of my old days of having commune's Jehari and my mouth watered. Ujir had taken Ogura, a Japanese journalist, to Thawang. When I met him in Kathmandu, he said, "I fed commune's Jehari to Ogura too." It is not only my story. Everyone who goes to Thawang also adds up a new relation with the commune's Jehari. The request of the girl at the commune's Jehari Pasal, who said, "Please, do not forget us. Keep on coming," made me once again feel heavy to leave Thawang. However, we left Thawang with our heavy luggage for Rukum. Although we left Rolpa in mid-March, our broadcasting started only after the first week of April. It took about 20 days for its construction and management. Most of the news of that time was about the confrontation between the security force of the government of Nepal and the people's army of Nepal (Maoists) in the early days of our broadcasting. Such news was natural in this season because the winter had just ended and April and March were the months of summer and confrontation. Our radio had just started broadcasting when the people's army (Maoists) attacked at Khara the Rukum district battalion of the Nepal army and the Nepal armed police in March 2005. Our station was not far from Khara. We could see Khara from there with our bare eyes. Radio Janaganatantra broadcasted the Khara confrontation live. It was most challenging and risky to have the live broadcasting. This adventurous task was accomplished by our team member Sachin Rokka. Generally, it would broadcast only from 6 to 8 p.m., but that day we broadcasted people's revolutionary songs until late at night. People estimated: "Something unusual is going to happen today." Some of them called our radio station and inquired, "Is anything unusual going to take place today? Why didn't you stop broadcasting at 8 p.m.?" We replied, "It is because of some special reason." "What is special?" they asked. But after 9 p.m., the Khara attack by the rebel Maoists was broadcast live and they knew the cause themselves. The live broadcast of the Khara attack lasted to 12 p.m. The police also reported all the details to their headquarters. The Maoists could not win in this attack on the Khara military camp; however, Radio Janaganatantra got the opportunity to broadcast the confrontation live. No sooner had the confrontation ended then more danger hovered around the radio. Just after this historical opportunity for our radio, we had to face the "Khara Operation" by royal army. They lunched "search and destroy operations" all over Rukum and Rolpa. This made us much frightened. "What if they found our radio station?" The radio station was very near to the army camp so it was very risky because they could easily find it. Carefulness and patience was most demanded of us. We called an emergency meeting of our team about whether to run the radio or to stop it during this risky time. If the army searched the villages, perhaps the people could go to a safer place. The people's army could resist, but what could our radio team do? We discussed it minutely. By that time the security team assigned to the radio station was also in the war. After the meeting we decided not to stop broadcasting. It was our duty to broadcast the truth about the possible confrontation between the revolutionaries and the royal army. Otherwise, the royal army would broadcast all its lies through Radio Nepal, the government-owned radio station, and mislead the people. So we decided not to close the radio. At that time, because of the royal coup by King Gyanendra, most of the FM radio stations were denied permission to broadcast news and there was hard censorship of the newspaper. Therefore, we had a greater responsibility to inform the people rightly. So we decided not to close the radio even in this adverse situation. Many confrontations occurred between the royal army and the people's army. We broadcast every event in detail. In the operation in Khara the royal army could not harm the Maoists much; rather, the royal army had to lose many things. Operation Khara was going to be over soon. In the course of the operation, one team of the royal army reached the village where we had had our station. It was a great threat for us. The army started firing. They burned one of the houses in the next village. They started vandalizing and looting in our village too. This compelled us finally to close the radio after only one hour's broadcasting. We were at the top of the hill and the royal army was at its foot. It was not very far. They could climb the hill at anytime at night. After closing the broadcast, we started to pack all our instruments -- antenna, transmitter, phone set, computer, mixture, microphone -- into the sacks. Ten bags and some sacks were filled. "Where to hide these instruments?" we wondered. Finally, we decided to take them to a cave by the side of the hill. There was a very steep cliff above and below the cave. So we thought the royal army could not reach there and our instruments would be saved. Even after hiding the instruments, we remained awake for the whole night. Although it was April, cool air blew the whole night. We spent the whole night in the chill night. However, nothing tragic as such took place. The royal army could not get any information about our station and left the village early in the morning. Next day, we were very delighted to have been saved from a possible disaster. We carried all the instruments back from the cave, fit them in their proper place, and started broadcasting with new sprit to inform the people rightly. The most interesting thing to remember now is that our FM radio station was conducted in a bunker, a deep ditch, for safety.